Chocolate picada sauce is like a chimichurri with chocolate added to it. 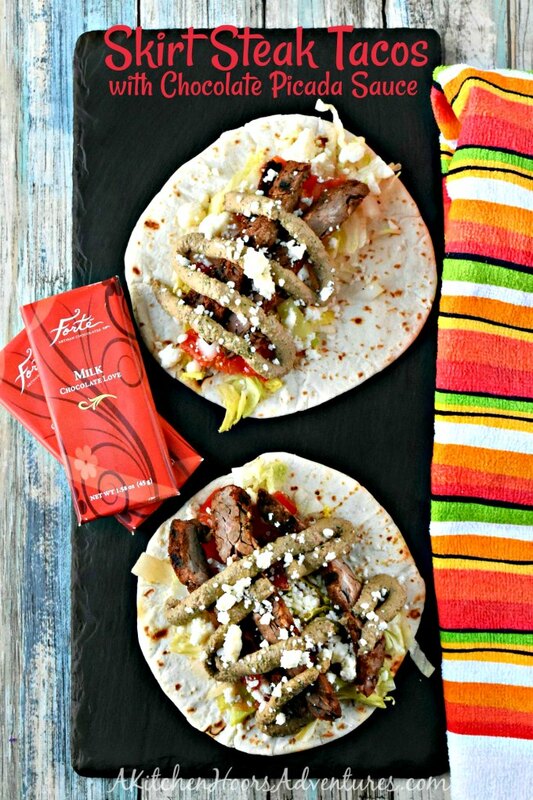 It’s packed full of flavor and perfect on these Skirt Steak Tacos with Chocolate Picada Sauce. There are so many uses for this versatile sauce you’ll keep it one hand all the time. I received samples from Forte Chocolate, but as always opinions are 100% mine. So, I had a bit of a chat with myself about savory chocolate recipes in the triple chip cookies post. I referred to many recipes that use chocolate in a savory way and not always a sweet way. Of course, I think most of them are Greek, Spanish, or Latin American inspired. I didn’t come across any that were outside of these three parts of the world. Which I think is interesting. Don’t you? There’s a ton of mole recipes. Of course, I made a pumpkin mole for some tamales and a mole rub for burgers. That’s it for mole on my blog. At some point, I’d really like to try to make black mole sauce. It sounds divine! But, that’s for another day. I almost did, in inadvertently, in my first try at the pumpkin mole. I’ll have to tell that story later. There are countless chii recipes. The most famous of which being Cincinnati chili which is, as I understand it, a derivative of a Mediterranean dish. It’s far from a typical, Texas chili, too. But it is oh so delicious and perfect atop a mound of spaghetti. Of course, you can’t forget the cheese and onions. And finally, add the beans for the full 5-way experience. I’m a four way kind of girl stopping at the onions. Of course, you can add chocolate any number of grilling rubs. I have a chocolate grilling rub from last year that is perfect for a hearty steak or roast. I have a great mole rub I used for some flat-iron steaks, too. The rub for the burgers is different, thank you! They’re not exactly the same. I don’t have any savory chocolate sauces on my blog. I wanted to remedy that. But outside of a chocolate cabernet sauce, which sounds delicious but not quite different enough for me to really put some effort into, I wasn’t finding much. But then I stumbled on this chocolate picada sauce. So, I went down the rabbit hole of picada sauce. Well, it’s one of the essential to Spanish cuisine sauces. It’s most prominent in the Catalan and Valencia regional cuisine. How have I not heard of this before? I guess I don’t know a lot about Spanish cuisine. This makes me want to learn more though. The picada is an almond, garlic, toasted bread, and parsley sauce. Most have it blended into a pasta like a pesto. However, there is one recipe that shows it more like a chimichurri than a paste. It has finely chopped almonds, garlic, toasted bread, and parsley all swimming in decadent, Spanish olive oil. I’m drooling. Are you drooling? Sounds divine doesn’t it? You can use it to top meat or you can use it as a base for a gravy, sauce, or soup. It’s this completely versatile and deliciously rich entity. I mean, I can’t call it a sauce if it’s a base for another sauce. I can’t call it a base or a roux because sometimes it stands alone. It’s just this thing that is amazingly delicious. And that, my dear readers, is why I made chocolate picada sauce. Mine is more along the lines of chimichurri version. Though, I did make the pesto version that is used more to enhance or thicken sauces. This might pop up in some recipes I’ll be making soon. Because, well, I’m a food hoarder and hate throwing out perfectly good food, remember? I’ll find some use for it in the next few weeks. Who knows? It might show up in a recipe I’ll be making tomorrow. You’ll just have to see! And now you can see why I had to make this sauce! It’s deliciously flavorful like a chimichurri sauce. It works well with all kinds of grilled meats like this Certified Angus Beef brand skirt steak I bought at my local Weis store. It’s been so crappy lately with all the rain, the first chance I got to grill, I did! And I’ve been drooling over having that skirt steak since I bought it, too. Of course, you can’t make a sauce like this with just any chocolate. You need a quality chocolate bar to chop and add to the sauce. In my case, that’s a Forte chocolate bar. If you don’t know about Forte chocolates, let me skool ya a minute. Forte chocolate is the mastermind of Master Chocolatier, Karen Neugebauer. Her emphasis is celebrating the chocolate which means each piece is crafted by hand and not mass produced like other chocolate bars. This includes tempering, pouring, dipping, and package all by hand. That is simply amazing. Their forte, at Forte chocolate, is celebrate the chocolate by celebrating life. If you think about that, it makes sense. When we celebrating life moments, there’s almost always chocolate involved right? Wedding favors almost always involve chocolate. Anniversaries, baby showers, graduations; take your pic chocolate is there somewhere. Even on just plain old winter day you’re celebrating sitting on the couch with a blanket and two dogs and watching your favorite movies with a cup of hot cocoa. Since we’re celebrating all things chocolate this week, Forte has offered up a special offer for our readers. If you purchase three bars from Forte chocolate, they will send you a fourth bar for free. With flavors like lemon and pepper, rosemary and sea salt white chocolate, and balsamic vinegar, you can’t pass up on trying their chocolates. The rosemary and sea salt white chocolate smells intoxicating with it’s rosemary flavor. I can’t wait to create something with those bars. They created a new line to use in savory recipes. Hence why all my talk about chocolate in savory recipes. I mean, come on, balsamic vinegar chocolate? You can’t skip trying your hand at a chocolate vinaigrette or pan sauce. They just scream creativity and ingenuity, don’t they? You have to know that this one of those it tastes better than it looks situations. What I didn’t consider when I refrigerated the sauce is that it would thicken. So, reader beware. You might want to keep some chicken broth on hand to thin it if you’re making it ahead of time. What does it taste like? Let me tell you, I thought it had an amazing flavor! You can taste the sweetness of the nuts and the chocolate. There’s the bite of the garlic and the crisp flavor of the parsley and Cuban oregano which brings the savory element to the front of your palette. Finally, the brightness of the red wine vinegar brings it all home and rounds out all the flavors. This stands up as a sauce on it’s own. Since I have quite a bit left over (it does make a good cup to cup and half of sauce) I might have to add some to the mole chili I’m making later today. Or maybe I’ll save it and try a pan sauce for some chicken breasts I’ll serve up tomorrow. I imagine it would blend well into a nice chardonnay for a rich and creamy pan sauce. Then again, I have that pumpkin gnocchi in the freezer. I bet with some cream it would make a delicious sauce for those pillows of pumpkin goodness. You need to check our Forte chocolate. I could tell when I was chopping it that it was quality chocolate. Where most bars crumble and you’re left with a powder all over your cutting board, these bars didn’t do that. They chopped with very little mess. It was a perfectly tempered, crisp bar and a complete pleasure to cook with. I had no idea chocolate could be this good. Make sure you check out their website and the amazing #Choctoberfest offer. Also, you’ll want to enter the giveaway, so give yourself a head start and follow them on Pinterest, Facebook, Instagram, and Twitter. Looking for a few more savory chocolate recipes? Try some of these! Chocolate picada sauce is like a chimichurri with chocolate added to it. 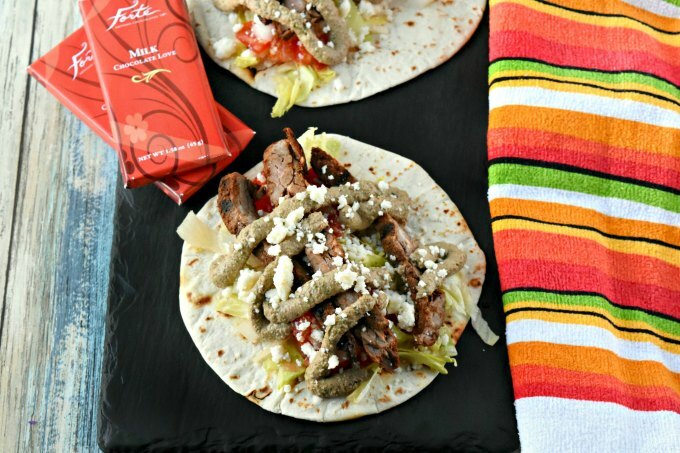 It's packed full of flavor and perfect on these Skirt Steak Tacos with Chocolate Picada Sauce. There are so many uses for this versatile sauce you'll keep it one hand all the time. Place the almonds and hazelnuts in a skillet over medium-high heat. Toast until fragrant. Place in a food processor but do not process them yet. Return the skillet to the heat and toast the slice of bread until lightly browned. Tear up and add to the nuts in the food processor along with the chopped parsley and Cuban oregano. Coarsely chopped the Forte milk chocolate and add it to the food process. Pulse a few times until coarsely chopped. Pour the olive oil in the pan and add the garlic. Cook the garlic until fragrant and lightly browned being careful not to burn the garlic. Add the garlic and olive oil mixture to the food processor along with the red wine vinegar. Process until combined. Pour the chicken broth in the skillet and bring to a simmer. Pour into a measuring cup. With the processor running, carefully stream the chicken broth into the processor until the mixture is light brown and the consistency of a crema. Set aside. Rub the skirt steak with the taco seasoning on both sides and allow to rest 30 minutes. Preheat the grill on high heat. Cook the shirt steak 2 to 3 minutes per side or until it reaches your desired internal temperature. Rest 10 minutes before slicing. Heat the tortillas on the grill being careful not to burn them. Cover in a clean linen towel to keep warm. Slice the skirt steak across the grain for serving. Top with the queso fresco, avocado, and your choice of toppings. Garnish with the chocolate picada sauce and serve. As always, you knock it out of the park with a unique recipe. 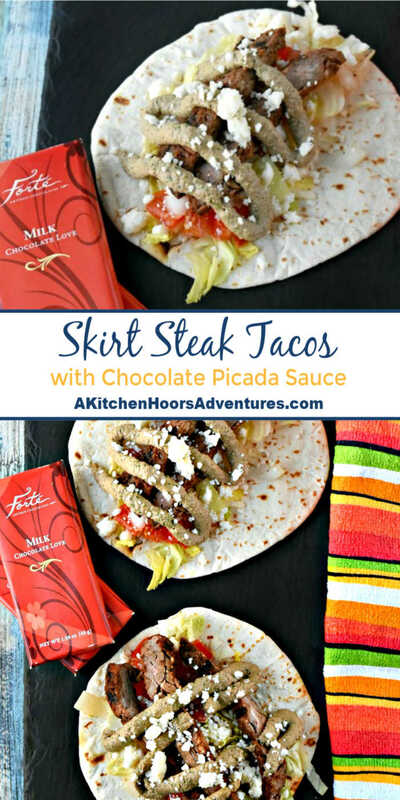 Love the chocolata picada sauce – way to mix up taco night! Right? I’m definitely revisiting this to make it more like I thought it would be; chimichurri. It’ll be a two fer!